Adulterous husband + boisterous soccer team + crotchety woman in Sweden’s backwaters = Ha?! After loving the international sensation of A Man Called Ove , I was keen to pick up the new novel by Swedish author Fredrik Backman. Alas, Britt-Marie Was Here did not quite meet my expectations. Backman seems to be relying on a formula—which, in A Man Called Ove, is exceedingly successful. He takes a curmudgeonly, inflexible older adult who sees the world in black and white, then he throws in a rowdy crowd of new neighbors that cause the older adult to stretch him/herself in unanticipated ways. In A Man Called Ove, this worked. In Britt-Marie Was Here, I found the whole thing to be forced and, at times, unbelievable. Britt-Marie has led a tragic, rigid life. After learning of her husband’s infidelity, she leaves her disappointments behind and flees to a village in the Swedish countryside. She somehow manages to get a job running the recreation center and—cue the new neighbors—finds that she enjoys soccer and is able to inject a fresh (if odd) vigor into the crumbling community. 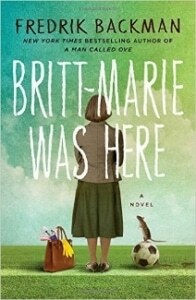 It’s a sweet story, and if you’re in the mood for a feel-good book Britt-Marie Was Here is a nice choice. For the more discerning reader, however, the pieces don’t fit snugly. Among other things, I think husband Kent’s sudden remorse is highly unlikely. I also find the “violent” storyline involving two hardened young men in Britt-Marie’s neighborhood to be a stretch. And then there are lots of awkward conversations and dialogue, along with Britt-Marie’s bizarre all-purpose “Ha”, which she says repeatedly throughout the book. Perhaps some of these wonky parts result from the novel’s translation from Swedish to English? Or perhaps we are simply getting a less-than-stellar side of Backman. Backman does succeed in getting his main theme across. He writes, “At a certain age almost all the questions a person asks him or herself are really just about one thing: how should you live your life?” I’m sure every reader can identify with this idea, and some might even see themselves in Britt-Marie as she stumbles along, inadvertently finding the answers.